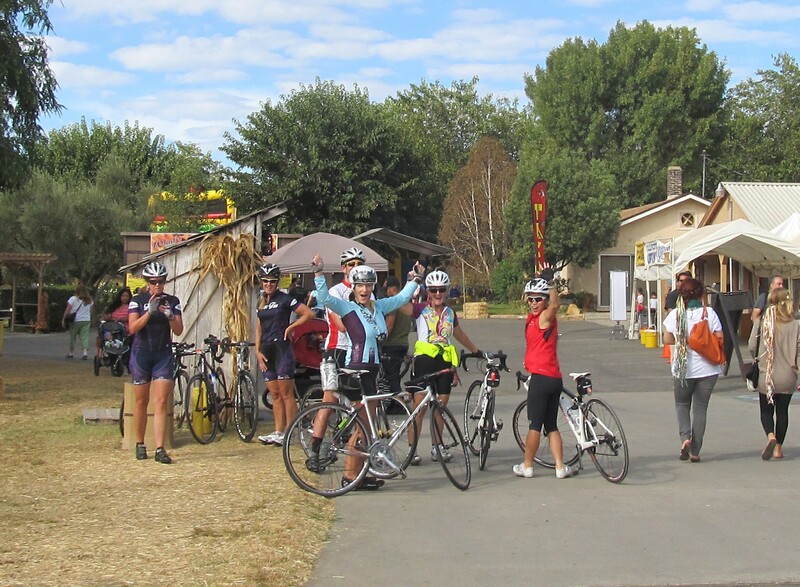 The Bates Nut Farm ride was a bit of a change from our usual Saturday rides. 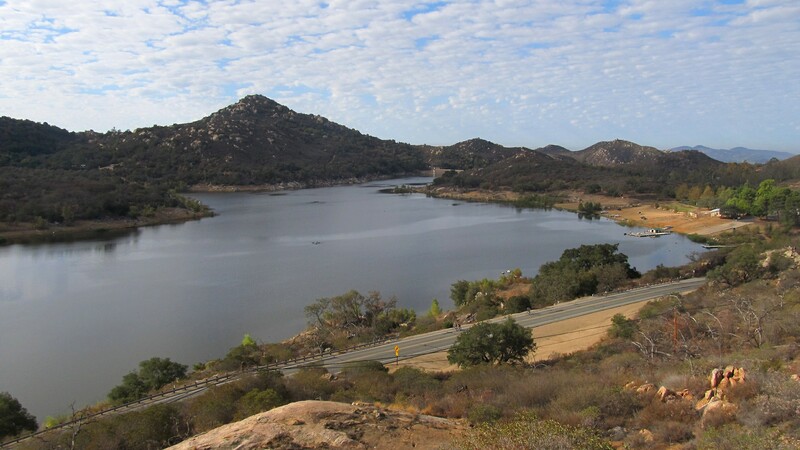 Instead of starting from the bike shop, we started from the Lawrence Welk Resort on Old Hwy 395 on the outskirts of San Marcos and North Escondido. This was definitely out of the way for many of our Team Fun gals, who live on the coast or south of the 56. But the drive was worth it – the route offered quite the change in scenery. With Judy leading the B group and Julie leading C, both groups rode together. 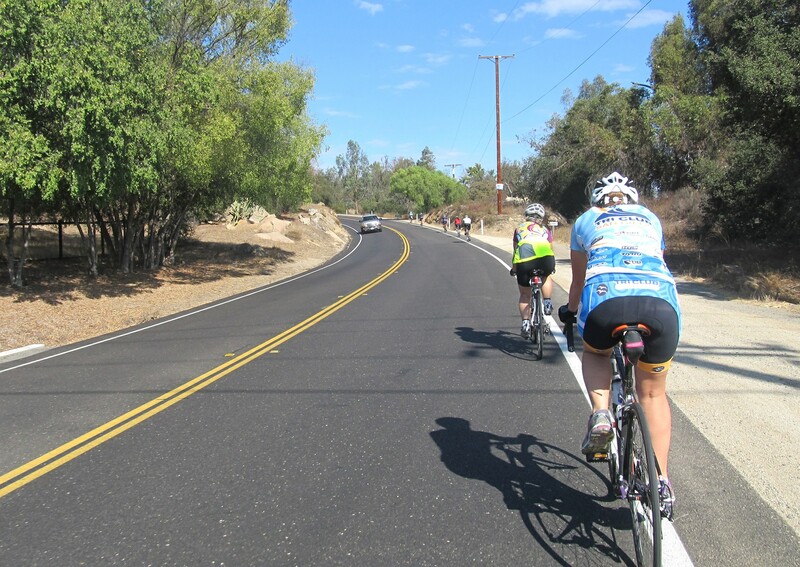 Sian was the only C group rider to come out and brave the inland hills. She decided to do the B ride. Kudos to Sian! She did great! Heather K, Judy. Andy & Jill on Lake Wohlford Rd. 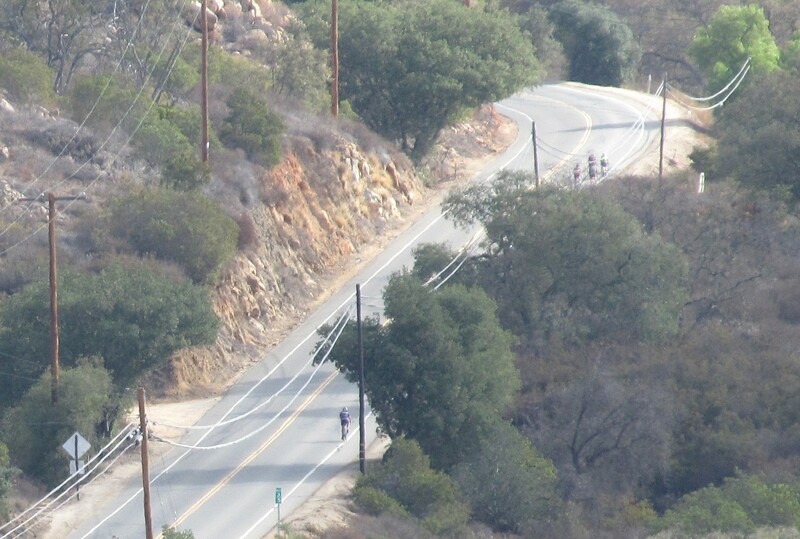 We headed up Champagne Blvd towards San Marcos – a 2.5 mile steady climb to Deer Springs. We met up with the A group (Heather K and Jill (aka Pippi) at the top of the Champagne climb. 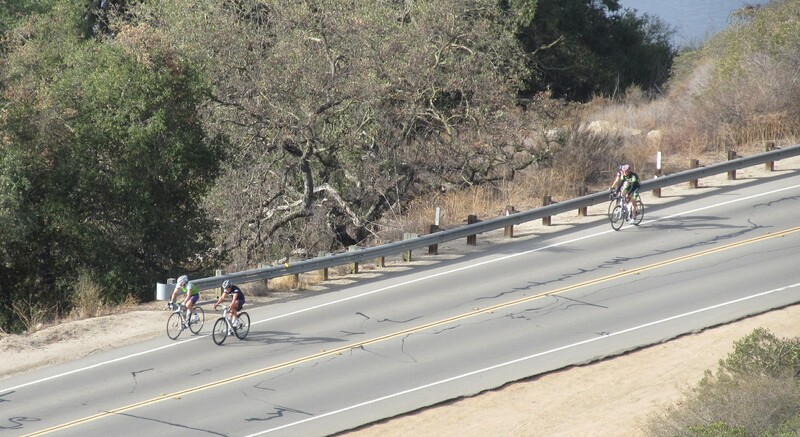 Okay, so they didn’t meet us at 8 am and do the Champagne climb, but they did ride all the way from Heather K’s house in San Elijo – climbing 100 feet per mile just to get to the start. I guess they earned the right to wait for us at the top of the hill. Judy’s husband, John, joined the B group. 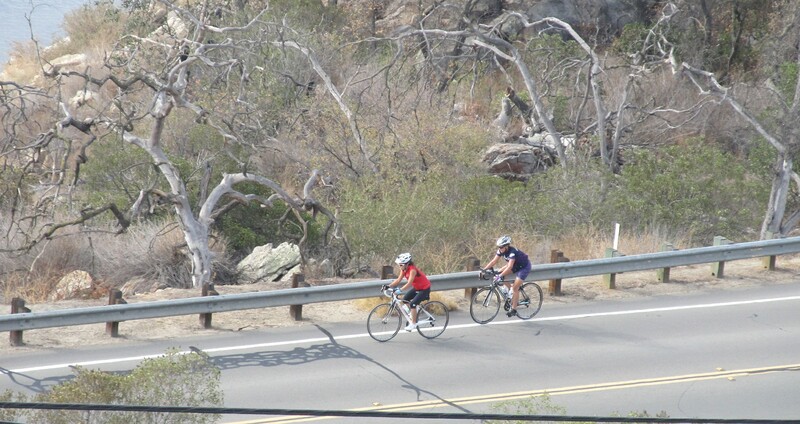 He typically rides alone every Saturday and loves the inland roads. Lake Wohlford is one of his favorite rides, so he agreed to join the ladies today. But he wasn’t the only guy. Andy, from the Carbon Connection team, joined us as well. Though we are a women’s group, it’s always a pleasure to have the company of our male counterparts. Lake Wohlford & Lake Wohlford Rd from the overlook. After the initial ascent up Champagne, we proceeded down Hwy 395 until to Jesmond Dean Rd. We descended the lovely shaded road to N. Broadway in Escondido, From there we got onto El Norte Pkwy, which took us all the way to the Valley Center Parkway grade. Heading north on Lake Wohlford Rd. We continued on Lake Wohlford road until we reached the intersection of Woods Valley Rd. It was here that Group A and B split apart for good. The A group continued without stopping. They had a long ride ahead back to Heather K’s house. The B group gathered at Bates – a busy, popular place this time of year. Typically quiet, this day we encountered crowds of kids, parents, grandparents, dogs (some in costume), and pumpkins galore! It was the last Saturday before Halloween. (Team) Fun time at Bates Nut Farm. California has the best of so much. We have rural farm lands, meadows with horses running free, mountains, miles of golden coast, surf, palm trees, and moderate weather (and yes, 60 degrees is moderate even if most Californian’s think it is freezing). Michelle made her appearance at Bates. The pictures were already taken. Thanks again, Michelle, for capturing our ride up Lake Wohlford. Single-filing up Lilac Rd in Valley Center. Old Castle Rd’s shady bottom. We all made it back safe and sound, as I am sure the A group did as well. The route wasn’t one of our longest rides but what it lacked in mileage, it made up in character. 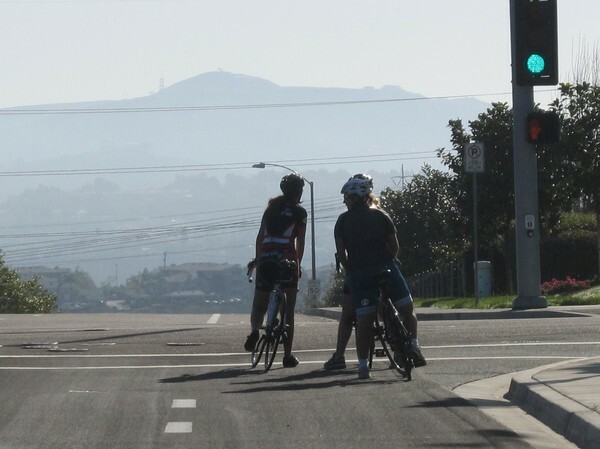 Next Saturday (Nov 8st) B group will be looping around Vista and Carlsbad and C group, benefiting from the return of Heather B (Yey!!! ), will do a short recovery ride along the Coast Hwy. Both groups will start/finish at Carbon Connection Cyclery in Carlsbad. Come out and ride with us!